An underwater hunt is an exciting occupation! Try it yourself! Shoot at fish and crabs, just try not to shoot the diver! 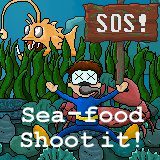 The sooner you shoot all the underwater creatures, the more points you will get! Games Similar Sea-Food Shoot it!